We've made it a year in cloth diapers… and still going strong!!! I even get the privilege of helping other families get started with cloth on a regular basis. Feel free to be in touch if you have any cloth diapering questions. A while back I wrote a post about our first 6 months using cloth, thought it was about time for an update! Cloth is easy… but there is still a lot to learn. Try to find a couple friends (or you could always contact me ;)) that you can call or text as you go. Pick a system or two and go with it. This keeps things easy in the beginning. You will probably add to it here and there, as you find out what you like best. For us, we love pockets, but I have other friends that don't, so you just have to see what works for you! When we were babies, almost nobody cloth diapered… it just wasn't the thing to do. As friends of mine are choosing cloth more and more, it is there parents that tend to be most opposed to the idea. My suggestion- show them how easy the new cloth diapers are, show them how much money it will save and show them how much waste it saves. As for others that think I am crazy, I see it as a time to educate! And for you working mamas out there, there are many daycares that take cloth diapers now, we just have to start asking and insisting! There will probably be a time that the washing doesn't go quite as planned, your diapers aren't fitting quite right, or your diapers are not working for night time. That's what the support is for, there is help out there for figuring things out! 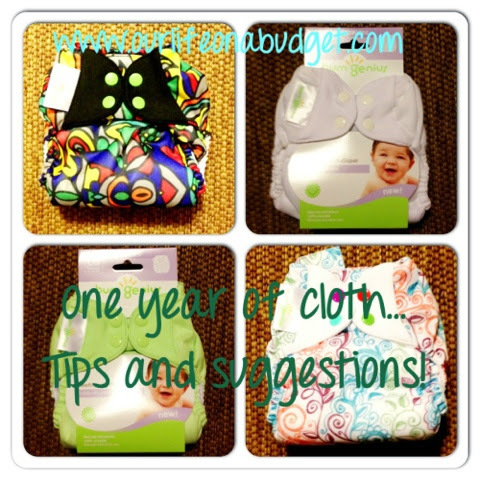 What have you learned about cloth diapering? What do you still want to know? Follow me on Facebook, Pinterest, Instagram, and/or Twitter. Or subscribe via email on the sidebar and never miss a post! I don't diaper anyone, but I can tell you how to get soap out of fabric. Soak it in the washer with lots of water and a couple of cups of vinegar. I'd say a good soak of 15-30 minutes followed by a wash cycle without soap ought to do the trick. The vinegar will completely rinse out, so your baby won't smell like an Easter egg, and vinegar is a natural fabric softener, so the diapers may well come out softer than before. A small washer would work fine. It is best to wash diapers frequently, so with a small washer you'd pretty much be forced to.